Lunar Eclipse and blood red moon sequence over Arch Rock, planet Mars above the moon, composite image, Joshua Tree National Park, April 14/15 2014. 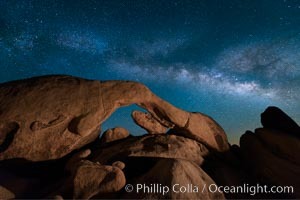 The Milky Way galaxy arches over Arch Rock on a clear evening in Joshua Tree National Park. Star trails and Arch Rock. 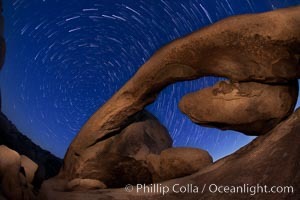 Polaris, the North Star, is at the center of the circular arc star trails as they pass above this natural stone archway in Joshua Tree National Park. 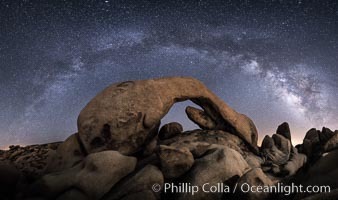 The Milky Way stretches across the sky above Arch Rock in Joshua Tree National Park. 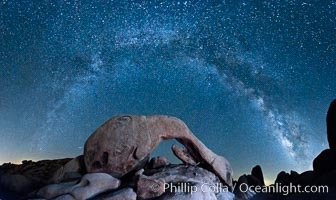 The Milky Way galaxy arcs above Arch Rock, panoramic photograph, cylindrical projection. 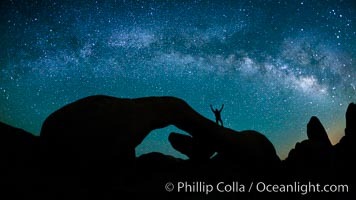 The Milky Way galaxy above Arch Rock, Joshua Tree National Park, night star field exposure. 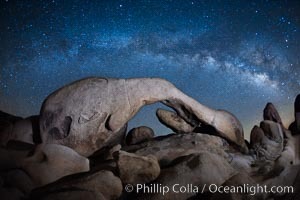 Milky Way at Night over Arch Rock, Joshua Tree National Park. 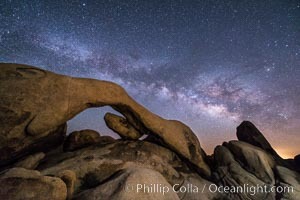 Panoramic image of Arch Rock at dusk.